Virginia’s Attorney General Ken Cuccinelli wants to be governor but throughout this process of running more and more information about his extreme views are being revealed. Before transvaginal ultrasounds were a household term, thanks to Cuccinelli and his buddy Bob McDonnell, he was a private attorney who was very active in the Father’s Rights movement. With regards to the Violence Against Women Act, these Father’s Rights groups have been called out for essentially operating as an organization that discriminates against women who are suffering at the hands of their abusive partners. Nationally, fathers’ rights groups also have opposed the federal Violence Against Women Act, partly because they think it has fueled false abuse allegations. A group previously run by Grignol, Respecting Accuracy in Domestic Abuse Reporting, claimed in a 2007 report that because of the Violence Against Women Act, “over 1 million false allegations of domestic violence are filed each year.” Women’s rights groups and other critics strongly dispute that false claims are so widespread. This year, 47 state attorneys general sent a letter to Congress urging lawmakers to reauthorize the Violence Against Women Act. Cuccinelli was one of three who did not sign it. 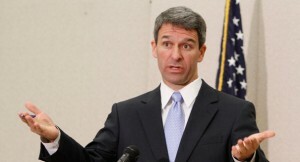 His spokesman said at the time that Cuccinelli would not support a bill that was still subject to change. Cuccinelli seems to have left off his history with Father’s Rights groups from his campaign website but the record still stands. It’s one thing to defend a guilty client to make sure the criminal justice system is working fairly, it’s a whole different thing to defend clients as part of an agenda that believes women lie about domestic violence and to help facilitate child custody for the abuser so they can continue to harass the victim. Here’s hoping Virginians won’t elect the second coming of Bob McDonnell as their next governor.